Toc Toc is a fun, fast-paced game of dexterity that many have described as a "Reverse Jenga". With over 10,000 copies sold in Korea, this hit game is now taking the US by storm! Play from 2-7 players as you become a woodman (or woman) trying to take down some bark (+1 point each) without knocking off the center pieces (-5 points each). You get 2 chops with the axe each turn and the game continues until all the bark is gone! This is a great dexterity game for all ages. Toc Toc Woodman is a super simple game, but surprisingly fun. You take a little plastic axe and hit a little plastic tree. You try to knock the little plastic bark pieces off without knocking off the little plastic core pieces. You get two hits with the little plastic axe. Little plastic bark is 1 point, little plastic cores are -5. Once all the little plastic bark is gone, you add up the points and figure out who the little plastic winner is. The rule book can be read in about 37 and a half seconds. This is a game screaming for house rules. There is an expansion as well consisting of a golden axe and golden bark and core pieces. The components are sturdy and well made…and also loud when they bounce off the floor or table. It’s fast and easy to setup and even faster and easier to knock it all down again…just try to have more bark pieces than core pieces. Little plastic defeats are fun, but little plastic victories are even better. -Fast, simple, and appealing. Most anyone will play this game and have fun doing it. -Fun. The important part of a game. It is. It has it. Have some of it. -Affordable. It’s a good price for a box full of little plastic fun. -Hoping for more stuff in the future. It has room for some strange and entertaining expansions. I hope to see them. Super simple. This isn’t so much a con as it is just a heads up. Even though this game is super fun for a while, you won’t want to play it to much. Put it aside, do other stuff, and the next gaming session you will break it out again, but only for a short period of time. 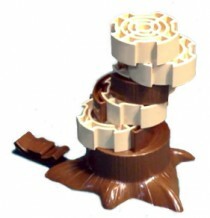 If you like dexterity style games like Jenga, Toc Toc Woodman improves on that. Anyone of any age can play this game and enjoy it. It won’t see a lot of long play sessions but there is a good chance it will be played often, even if only for short periods of time. Hitting things is fun. Knocking things over is fun. And there is even a funny looking bird on the box. Bonus! Toc Toc Woodman is a topple game that by far outshines Jenga. The shape of the pieces calls for a bit more observation that Jenga. The set up for toc toc woodman, is usually faster. The problem with JENGA is that a majority of people with tremors or big hands have a much more difficult time playing the game. The use of an axe is an extension of the body that makes everyone’s hit the same size. It’s quick, allows for multiple rematches, and if it does last longer than expected it becomes all the more exciting. So why is it a 9? 1.) The game is so simple that there’s room for more. 2.) The simplicity of the game can degrade the replay value over time. For the average person, it’s only a matter of time before they will want to go back and take another whack. This is a surprisingly fun game for people of ALL ages, adults, kids, and families. I think it’s an excellent addition to any boardgame library. This is one of a group of games I called “minor action” games, which seem to be popular in Korea, where this game originated. By minor action, I mean, there is some dexterity involved, but you aren’t playing twister, you are just very delicately tapping the sides of the plastic tree with an axe, in an attempt to knock off a piece of bark (worth one point), while trying to NOT knock off a piece of core wood, worth negative 5 points. It’s amazingly simple to learn, and surprisingly, it does have a lot of replay fun value. For smaller kids, there’s basic math, so it’s educational, and the potential fun of the “Board” basically exploding all over the table. For adults, it’s still a lot of fun; when I set it up at Origins, people would play, get mad they made a bad cut, and then insist I set it up again right away. And it had a whole room full of people laughing! I like the fact that you could play this game with kids, adults, or a mix; I’ve even played it with my 76 year old mother, and she enjoyed it. Sure, if you’re really into in depth strategy games, this isn’t going to be a favorite for you; but we all need a break sometimes, even from our regular games that we love, and I think this is the perfect game for that. This review is for the newer version of the game recently released through a Kickstarter campaign called Click Clack Lumberjack. My understanding is that the games are virtually identical, except Click Clack Lumberjack reduced cost by reducing packaging (A smaller, thinner box). The components are supposed to be the same. I am little unclear, but they may have added the grubs to the new version. In the box, you have a heavy plastic axe, a plastic stump and a whole bunch of light brown circular pieces and curved darker brown pieces. These represent the core of the tree trunk and outer bark of the tree respectively. This stuff is of nice quality, which is good, because it is going to be hitting the table and quite possible floor often. It is built to last. Put the bark pieces into the slots on the core pieces. Each core piece holds four pieces of bark. Each completed core piece will be stacked one on top of another atop the stump. That’s it. It takes a couple of minutes. Each player takes turns whacking the tree with twice with the axe. The goal is to knock down pieces of bark without knocking down core pieces. Hit any part of the tower you choose in an attempt to knock as much bark off as possible. It is kind of like a violent Jenga. Game ends when all bark is stripped from the tree. Each piece of bark is worth one point. Each core piece is worth negative five points. As I said, I think Toc Toc Woodman may not have had the grubs included, so I am putting that here separately. There are four grub stickers included with Click Clack Lumberjack. You affix each to a random piece of bark when you first open the game. These pieces of bark are worth an additional point to whomever has them at the end of the game, and, in addition to that, getting a piece of bark with a grub gives you an extra turn, which, depending upon the state of the tree, could be good or bad. You. Seriously. I have played with people of all ages, including my 2 and 5 year old daughters (over and over again), and it is easy to understand, easy to play and, most importantly, fun. This has had more playtime in the couple of months I have had it than any game in my collection over the past couple of years. This game is dead simple. The full extent of the instructions are on the outside of the box, and can be understood without further reading after playing a game. A game takes a couple of minutes to set up, and about 10 minutes to play. I would be surprised if you play once and put it away. The laughs are plenty when someone knocks the whole tree down, and no one is going to really care who wins or loses. This game is what games should be; it is all about having fun. Click Clack Lumberjack is supposed to retail for $20.00, and Toc Toc Woodman I believe goes for $25.00. Go get it. While most games have you building something up (a civilization, resource pile, or those ubiquitous victory points), Toc Toc Woodman gives your inner child a chance to break out and knock things over. Taking on the role of a lumberjack, you’re tasked with skillfully knocking bark from a tree with your oversized axe, while leaving the core in place. Take axe. Hit tree. Hit tree again. Cheer or groan based on results. Pass axe. Anxiously await next turn. The above section covers the basics of the game. Each turn you’ll hit a plastic tree with a plastic axe with the goal of knocking off bark sections. Each piece of bark (there are 4 per section, loosely attached to a larger core piece) is worth 1 point. If you knock off a core piece it gives negative 5 points. Once all of the bark is off the tree, whoever has the most points, wins. I am extremely pleased to have added Toc Toc Woodman to my collection. The rules are extremely simple, resulting in the 5+ age suggestion. The game looks great on the table, and people are drawn over to watch the game in action. 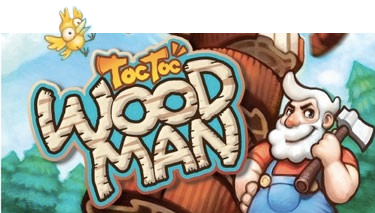 Toc Toc Woodman is great for getting even the most hesitant person to play a game. Plus, it’s harder than it looks to knock the bark off while leaving the core. While people care about the score, it’s quickly forgotten who won the last round as everyone chips in to help set the tree up for the next round. Distinctive, easy to learn, quick to play (under 10 minute play time), and regularly resulting in requests for multiple plays, Toc Toc Woodman is great as a game for kids, party game, or filler for between those meaty Euro games. Toc Toc Woodman is a fantastic game that everyone should try at least once. WHAT’S NOT TO LOVE. You have a plastic tree stump. On top of this you place 9 “rings” each ring consisting of a core and 4 pieces of bark which slide into grooves on the edge of the core piece. You also have a plastic axe with an oversized head that you use to tap the rings. if you knock the rings far enough out of line the bark pieces will fall out of the groove and land on the table. Each piece of bark is 1 point. But, be careful! if you tap to hard the “tree” collapses and the game is over. Whoever did not cause the collapse and has the most bark pieces wins. The game plays in 1-10 minutes depending on how careful you are. It is fun and visually appealing to people of all ages. Everyone takes turn whacking away the bark of that tree with a plastic axe. Do I really need to say any more? This game is like Jenga but with a loose ‘theme’. The goal is to get as much bark as possible but no wood ‘cores’. The cores give you minus points. I dunno why you want the bark but it doesn’t matter because this game is addictive fun. The gold axe and golden bark expansions are great too because you an make up house rules for it. Also having 2 axes come in handy. The component are really nice and feel sturdy. This is a must have for family gamers. The components are visually appealing. The game is very easy to play. Simply attach the bark to the rings, stack the rings on the stump, and take turns “chopping” on the tree with a plastic ax. I have played with family members from small child to teenager to adult and all have enjoyed it and played it several times in a session. This game is basically Jenga shaped like a stump. I enjoy it with friends, but there is not much strategy at all. It’s about dexterity and basic tactics. You use the same tactics as you do in Jenga: either remove a piece, or make it difficult for the next person… or both. If you already have Jenga, I’m not sure you need this. 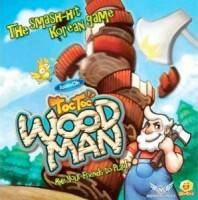 Add a Review for "Toc Toc Woodman"